Welcome to the Adventures of ColQuilts! Hello! 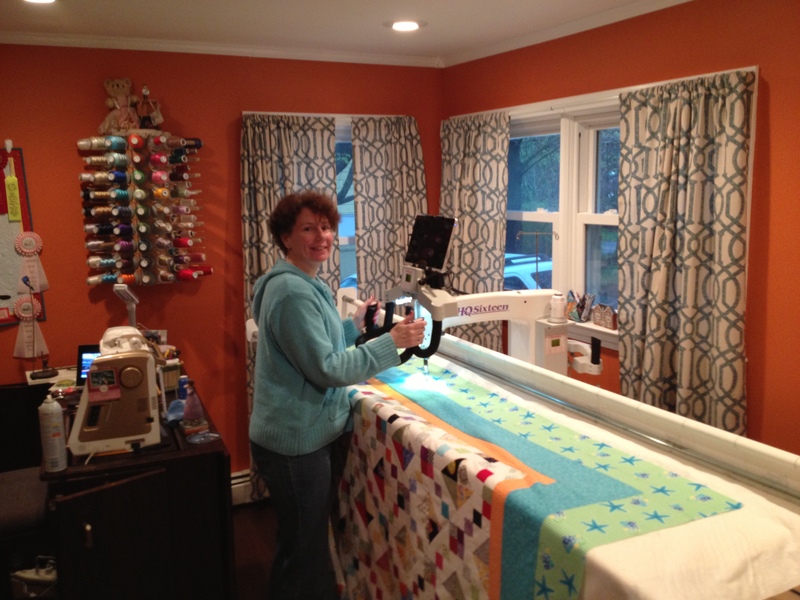 My name is Colleen and quilting is my passion! And so is fitness and running, hiking, cooking, and reading! Hovering at the half century mark, I have embarked on a journey of new growth the past few years. I’ve been working on improving my free motion quilting skills and have had quilts in Machine Quilter’s Exposition (MQX) which is a nationally juried quilt show. It was quite an honor to have my quilts accepted and I even won a faculty ribbon ! I have always been a bit of a klutz so when my friend, Genn, suggested I join her for a Zumba class, I thought she was crazy! Yet, it was a life altering event for me. I became a Zumba and fitness groupie, expanding my classes to include RIPPED and POUND. You can find me most evenings at ZLifestyle classes at the Clarkstown Reformed Church. I was inspired further by my friend, Jane, when she ran a triathlon. I decided if she could do that I could try to run a race. So I ran my first race with my daughter, Deven, and my husband, Michael, in November 2013. It was an amazing feeling pushing myself and challenging my body to cross that finish line! A year and a half later, I just finished my first half marathon! Hiking is another love of mine and it is a family affair. Luckily, we’ve passed that love onto our kids! Even our dog, Tucker, loves to go with us. Mike and I decided to try to climb the tallest peak in each state. So far we’ve accomplished Mount Washington in New Hampshire and Mount Marcy in New York. Mount Katahdin in Maine is our goal for this year! I plan to use this blog as a way to share mainly my love of quilting but will occasionally interject a post or two about a hike, a fitness event, a great recipe or family fun! I hope you’ll follow along! Where beautiful quilts are finished!